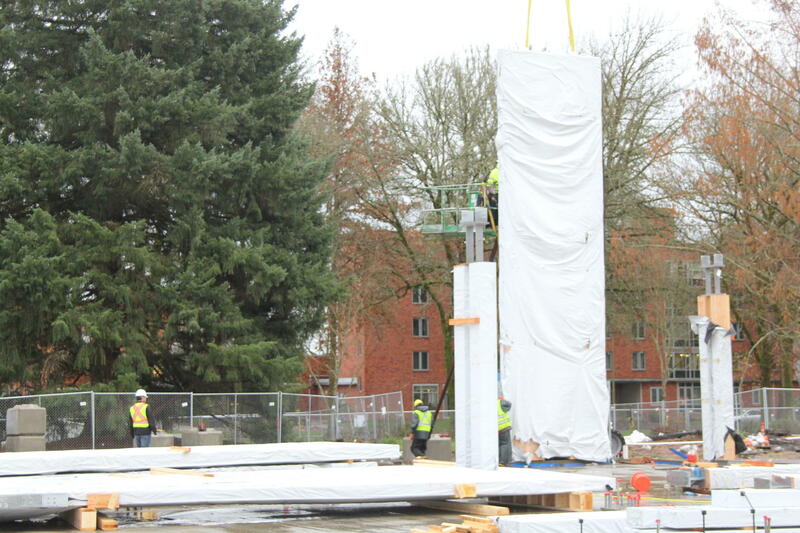 Oregon State University College of Forestry is constructing its new headquarters entirely out of engineered wood products. It will the first in the U.S. to use a “rocking wall” seismic design so it can survive a major earthquake. Geoff Huntington is Director of Strategic Initiatives at OSU’s College of Forestry. Cross Laminated Timber is a new wood technology that consists of 2 by 6 Douglas fir pieces glued together in a crisscross pattern, and pressed to create panels that are as strong as steel. The $65 million complex will use a “rocking wall” design which protects building occupants during a seismic event. It’s also supposed to withstand an earthquake and be habitable afterwards. The CLT panels installed this week were manufactured by DR Johnson mill in Riddle.